SILVER SPRING, MD – The Montgomery County Planning Department, part of The Maryland-National Capital Park and Planning Commission, is partnering with the Washington Area Bicyclist Association (WABA) to offer free public bike rides in April, May and June. Each ride will focus on amenities, businesses and other destinations around downtown Silver Spring, highlighting the many useful bicycle connections to trails in the area. Please note that each cyclist will be required to be responsible for their own bike, sign a waiver and wear a helmet to participate and rides may be rescheduled for rain. Check waba.org/silverspringrides for updates. These cycling tours are part of the Planning Department’s Silver Spring placemaking initiative to draw attention to the public spaces in downtown Silver Spring. RSVP for each bike ride on WABA’s website. These group bicycle rides are the result of the 2014 Silver Spring Placemaking Workshops that sought to activate existing underutilized and hidden public spaces in downtown Silver Spring, and encourage community interaction. Bike Silver Spring will show participants the transformational change that’s about to happen in and around downtown Silver Spring. One of the major goals of Montgomery County’s Bicycle Master Plan, slated for final approval this fall, is creating a low-stress bicycling network. The social rides are meant to familiarize the community with the growing opportunities for an easier ride around Silver Spring on two wheels. Montgomery Planning invites you to come along! Celebrate our planet by taking a family-friendly ride on Earth Day. Meet at Veterans Plaza at 10 a.m. in downtown Silver Spring and ride along Sligo Creek Park to Wheaton Park. On the way back, riders will have the option to help clean the creek with Friends of Sligo Creek. The route is 14 miles round trip, mostly on trails and quiet streets. Meet at 10 a.m. at Veterans Plaza and bike around Silver Spring at a gentle pace while learning about some of the public art you see every day (and maybe a few pieces that you hadn’t noticed). Bikers of all ages and skill levels are invited to enjoy the guided bike tour, which will be about five miles with many stops. On Memorial Day, streets in downtown Washington, DC near the National Mall will be closed to auto traffic. Ride with Bike Silver Spring from Veterans Plaza at 10 a.m. to Beach Drive in Rock Creek Park, and head south toward DC and the Mall (about 12 miles one way). After cruising the car-free streets in downtown DC, riders have the option to ride back the same way they came, take Metrorail back home or stay in DC for the Memorial Day festivities. Why not sweeten the ride with a treat? Join Bike Silver Spring at 10 a.m. for a casual ride through downtown Silver Spring and Takoma Park with stops at several local cafes and shops. Join the safari when Bike Silver Spring rides to the National Zoo. Meet at Veterans Plaza at 10 a.m., ride about 7.5 miles through Rock Creek Park to the zoo and enjoy a couple hours with the animals. You’ll have the option to bike back, take Metrorail or continue your own adventure from the zoo. 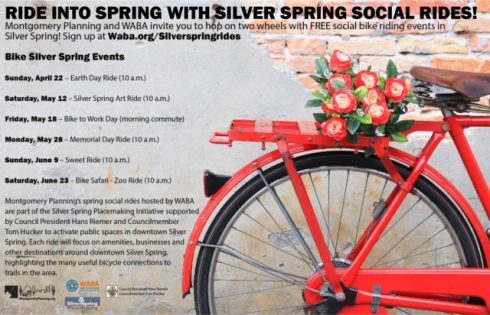 RSVP for each bike ride at waba.org/silverspringrides. In partnership with the office of Montgomery County Council President Hans Riemer, Councilmember Tom Hucker, the Silver Spring Urban District, Silver Spring Regional Center and the local community, the Montgomery Parks and Planning Departments hosted a series of design workshops in the fall of 2014 that focused on placemaking strategies for downtown Silver Spring. The workshops explored options to improve civic spaces at three locations – the Transit Center, Ripley District and Metro Plaza – as well as long-term strategies to implement the upgrades. Public participation in all three workshops helped generate creative ideas for how to use those spaces in ways the entire community can enjoy. The resulting Silver Spring Placemaking Workbook included recommendations based on these workshops.